Tiffany's Online Finds and Deals: Cheap digital camera camcorder ONLY $12.99 FREE SHIPPING! 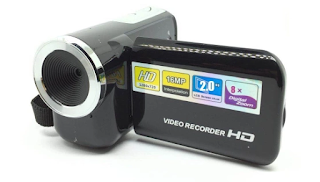 Cheap digital camera camcorder ONLY $12.99 FREE SHIPPING! Grab this digital camera/camcorder for ONLY $12.99 FREE SHIPPING! 65% OFF during tomtops flash sale. Would be a great cheap kids camera! This camera is small in size and light weight, it doesn't take up much space and does not add to the baggage burden when traveling. With TF / SD card function. Easy to operate and convenient for carrying. 720P clear display, portable and intimate playback.